The Riigikogu specified the Estonian Defence League Act, introduced amendments into the Code of Civil Procedure to establish the procedure for declaration of enforceability of decisions of arbitral tribunals made in Estonia, and made amendments to the Citizen of European Union Act in connection with the pending withdrawal of the United Kingdom from the European Union. The Riigikogu specified the Estonian Defence League Act, which gives the Defence Forces a wider opportunity to involve the Defence League in the performance of military national defence tasks, and better social guarantees to members of the Defence League districts. In the future, it will be possible to involve members of the Defence League districts for example in international military cooperation and for preparation for the military defence of the country. At the same time, the Act’s references to provisions in current law that are connected with the involvement of the Defence League in the Act were corrected. Under the Act, an active member of the Defence League is entitled to receive 30 days, instead of the current ten unpaid days of holiday, from his or her employer to participate in military training and upon involvement in a task related to rescue, law enforcement or the Defence Forces. The Defence League pays compensation from its budget, but if the Defence League is involved for example in the performance of law enforcement or rescue tasks on the Government’s order, the authority who requests involvement bears the above-mentioned costs. Under the Act, the Commander of the Defence Forces will have the right to authorise the Commander of the Defence League or a leader of a structural unit of the Defence League to approve the documentation of the wartime units prepared. The Defence League prepares the wartime units of the Defence Forces, and otherwise it would not have the right to approve the documents of other authorities. During the proceedings, the granting and suspension of weapons permits in the Defence League was harmonised with the provisions of the Weapons Act. It was also provided that the Defence League and the Defence Forces can use each other’s infrastructure and property without the fee provided for by the State Assets Act. The Defence League was also given the right to establish temporarily guarded areas for conducting military training which may be guarded by active members who have received the relevant training. The Defence League with 26 000 voluntary members is one of the most important mainstays of the national defence. The Act passed today will bring the activities of the Defence League to a qualitatively new level which will significantly strengthen Estonia’s national defence capability. In the course of the ongoing national defence law revision, all Acts in the field of national defence are reviewed. The Act on Amendments to the Estonian Defence League Act (786 SE) was initiated by member of the Riigikogu Ants Laaneots. 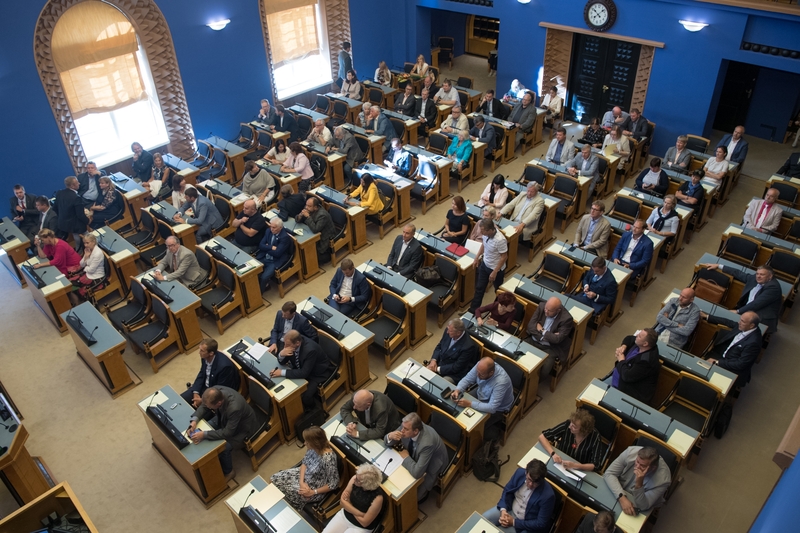 75 members of the Riigikogu voted for the passage of the Act. The Act on Amendments to the Code of Civil Procedure and Amendments to Other Associated Acts (establishment of the procedure for declaration of enforceability of decisions of arbitral tribunals made in Estonia) (749 SE), initiated by the Government, brings the regulation of arbitral tribunals into conformity with the practice of the Supreme Court. The main amendment harmonises the requirements for the recognition and declaration of enforceability of decisions of arbitral tribunals operating in Estonia. An obligation is created under which the decisions of all arbitral tribunals operating in Estonia must be declared enforceable, except for the decisions made in the proceedings of the arbitral tribunal of the Estonian Chamber of Commerce and Industry and the arbitral tribunal of the Chamber of Notaries. 67 members of the Riigikogu voted in favour of the passage of the Act, and six were against. The Act on Amendments to the Citizen of the European Union Act and Other Acts (Withdrawal of the United Kingdom from the European Union) (781 SE), initiated by the Government, regulates the conditions for residing in Estonia after Brexit for the citizens of the United Kingdom and their family members. As it is still not yet clear whether the United Kingdom will leave the European Union on the basis of a withdrawal agreement or without an agreement, the Act provides a solution for both cases in order to ensure the citizens of the United Kingdom residing in Estonia as smooth a transition as possible. If Brexit takes place on the basis of a withdrawal agreement, the Act ensures the conditions for residing in Estonia laid down in the agreement to the citizens of the United Kingdom and their current and future family members who are residing in Estonia at present, as well those who will come to reside here during the up to two year transition period. This would mean that, throughout the transition period, European Union law will continue to apply to the citizens of the United Kingdom, and they will be able to continue residing in Estonia on the basis of the right of residence, without anything changing in two years. The citizens of the United Kingdom arriving in Estonia as of April 2021 would already fall within the scope of regulation of the Aliens Act, which means that they will need a residence permit for settling in Estonia like all other citizens of third countries. If the United Kingdom leaves the European Union without an agreement, the Aliens Act will immediately apply to the citizens of the United Kingdom and their family members already residing in Estonia. In such a case, under the Act, they will be granted a temporary residence permit for settling permanently in Estonia, with the period of validity of up to five years, or a long-term resident’s residence permit, depending on whether they are residing in Estonia on the basis of a temporary or permanent right of residence at the Brexit moment. All citizens of the United Kingdom who wish to settle in Estonia after the withdrawal of the United Kingdom from the European Union will have to apply for a residence permit like all other citizens of third countries. 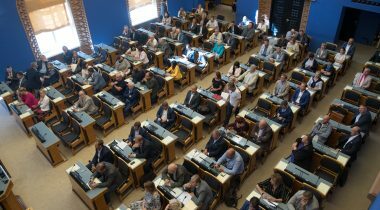 76 members of the Riigikogu voted for the passage of the Act.